Nuisance in English law is an area of tort law broadly divided into two torts; private nuisance, where the actions of the defendant are ""causing a substantial and unreasonable interference with a [claimant]'s land or his use or enjoyment of that land"", and public nuisance, where the defendant's actions ""materially affects the reasonable comfort and convenience of life of a class of Her Majesty's subjects""; public nuisance is also a crime. 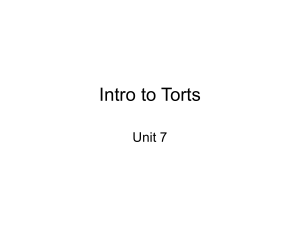 Both torts have been present from the time of Henry III, being affected by a variety of philosophical shifts through the years which saw them become first looser and then far more stringent and less protecting of an individual's rights. Each tort requires the claimant to prove that the defendant's actions caused interference, which was unreasonable, and in some situations the intention of the defendant may also be taken into account. A significant difference is that private nuisance does not allow a claimant to claim for any personal injury suffered, while public nuisance does.Private nuisance has received a range of criticism, with academics arguing that its concepts are poorly defined and open to judicial manipulation; Conor Gearty has written that ""Private nuisance has, if anything, become even more confused and confusing. Its chapter lies neglected in the standard works, little changed over the years, its modest message overwhelmed by the excitements to be found elsewhere in tort. Any sense of direction which may have existed in the old days is long gone"". In addition, it has been claimed that the tort of private nuisance has ""lost its separate identity as a strict liability tort and been assimilated in all but name into the fault-based tort of negligence"", and that private and public nuisance ""have little in common except the accident of sharing the same name"".